Sometimes it’s nice to know what a theater company you like is doing for its next season and the dates to put on your calendar. The “Sneak Peak” series does just that, listing the companies by area . Descriptions of shows will follow in the next series which will be by category such as world premier, classic, Halloween and holiday. Meanwhile click on the venues in “Sneak Peak” for the theaters’ own details. BTW, some companies use theater and others use theatre, thus the differences written here are deliberate and not typos. The venue is at 2936 N. Southport Ave. Black Button Eye Productions is doing “Nightmares and Nightcaps: The Stories of John Collier” here, Aug. 17 – Sep 15 in Studio Two. and Dream Big Performing Arts Workshop is doing “Alice and Wonderland Jr. Aug. 17- 18 on the Main Stage. Studio One has “Bliss (Or Emily Post is Dead)” through Aug 25 and Studio Three has “Bus Stop” through Aug. 19, 2018. “The Dark at the Top of the Stairs” is in Studio Three Nov. 22-Dec. 16 and “The Elder Son” is in Studio Two, Nov. 15-Dec. 22. For tickets and other information call (773) 935-6875 and visit Athenaeum Theatre. The theater is at 3745 N. Southport Ave. Currently, “Avenue Q” has been extended through Nov. 4, then “Pippin” is in the Venus Cabaret Theater, opening TBA followed by its annual “The Christmas Schooner, date also TBA. For tickets and other information call (773) 325-1700and visit Mercury Theater. 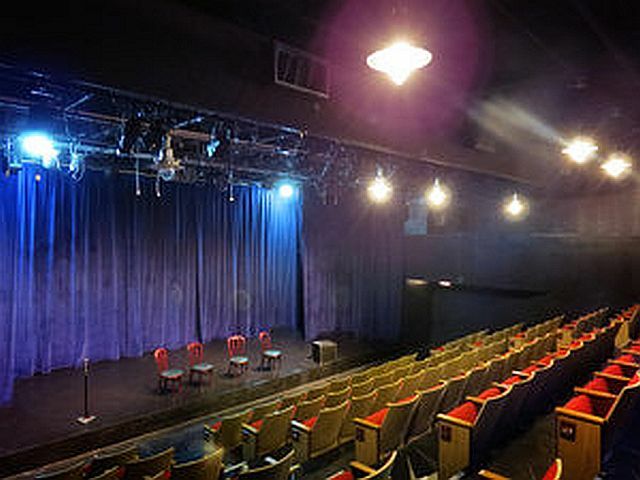 A multi-theater venue, Stage 773 is at 1225 W. Belmont Ave.
American Blues Theater is doing “Buddy: The Buddy Holly Story” through Sept. 15, then “Flyin’ West” Oct. 5-Nov. 3 and its annual holiday show, “It’s a Wonderful Life: Live in Chicago” Nov. 15, 2018-Jan 5, 2019. Hell in a Handbag has “The Artificial Jungle” Sept. 23-Oct. 28. and “The Golden Girls: The Lost Episodes” Oct. 13-Nov. 3. The Degenerates are doing “Potty Talk” Sept. 3- Oct. 29. Underscore Theatre Company in association with Theater Wit is moving “Haymarket” from the Den Theatre to Theater Wit, 1229 W Belmont Ave, Chicago to extend the run from Aug. 3 to Sept. 2, 2018. The Den Theatre, 1331 N. Milwaukee Ave., Chicago through July 22. For tickets and more information and tickets call (773) 975-8150 and visit Underscoretheatre. Related: Blue collar history and bluegrass music. 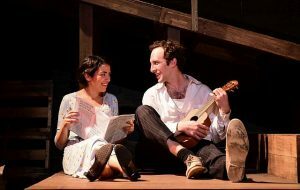 ‘Bonnie & Clyde,’ a Kokandy Productions musical now at the Wit Theater, is based on real outlaw lovers. They found nationwide fame during the 1930’s depression for their crime spree across the southwestern U.S. and lower Midwest. [Spoiler Alert] The couple famously met their end in a police ambush that resulted in perhaps one of the most salacious news photos of all time showing their bullet riddled bodies and car that ironically provided the duo with the notoriety they both craved. Young Bonnie (Tia L. Pinson) sweetly sings of being an “It Girl” like screen star Clara Bow and plans to be a movie star, singer and poet. In an age progression Clyde Barrow (Max DeTogne) and Bonnie Parker (Desiree Gonzalez) find love, linked by a mutual goal of fame and fortune that leads to their ultimate destruction. In the context of today’s news cycle these themes of violence are all too familiar and have the potential to make this death-wish love story somewhat uncomfortable. But it does make for good theater, particularly when combined with the music of Frank Wildhorn (Jekyll & Hyde) with lyrics by Don Black (Billy, Sunset Boulevard) and book by Ivan Menchell, performed by an outstanding cast of singers accompanied by a superb four piece orchestra. 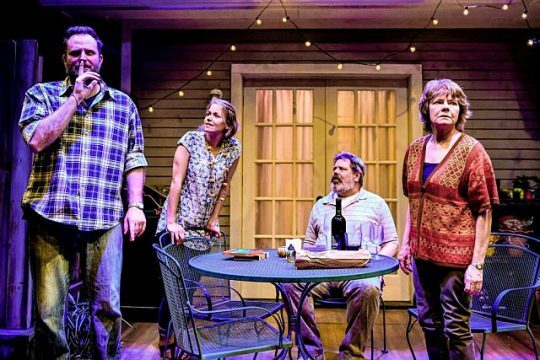 Originally presented at La Jolla Playhouse in 2009, and transferred to Broadway in 2011 this Chicago premiere production happens in a now familiar hodgepodge set by Ashley Ann Woods. In this case, it’s designed to represent a farm house, jail, café, bank, church and boudoir. The automobile where the two meet their end is skillfully handled. The storyline unfolds through a series of songs written in the “modern pop” genre with blues, gospel and rockabilly accents. This does a lot to keep the tension high and action moving but has a negative effect of seeming like it is constantly speeding. This, of course, mimics the fast paced life of the main duo racing through life. Clyde’s sister-in-law Blanche (Missy Wise) is the voice of reason who provides a welcome respite from the chaos with her tender ballad “That’s What You Call a Dream” and the humorous number “You’re Goin’ Back to Jail” with husband Buck (Justin Tepper) and the Salon Girls. Max Detogne who appeared in Theo Ubique’s production of ‘Jesus Christ Superstar’ has a voice tailor-made for this genre and infuses Clyde with all of the requisite humor and charm necessary for us to care about the character. “How ‘Bout a Dance” shows Bonnie’s softer side while the disturbing “Dyin’ Ain’t So Bad” reveals Bonnie’s other side and her commitment to live fast and die young. Tia L. Pinson is a potential scene stealer (in a good way). She is an “It Girl” who has a charming presence onstage and is someone to keep an eye on. 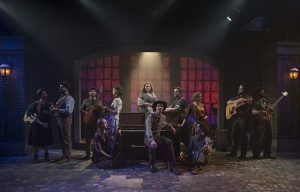 Kokandy Productions, a Theater Wit resident company, has put together a tight package effectively led by Spencer Neiman (Director) and John Cockerill (Musical Director). This is an instance where the subject matter on the surface is unsettling. It has the potential to make heroes of criminals and minimize the death and destruction they perpetrated. “Dyin’ Ain’t So Bad” comes dangerously close to romanticizing what is essentially a suicide pact between young lovers. In the end Bonnie and Clyde is a theatrical performance that explores the need for recognition and love. It explores romantic love, parental love, spiritual love, self-love, lost love and unrequited love. The mission of Theater Wit is to promote humorous, challenging and intelligent plays. Check, check and check. DETAILS; Bonnie & Clyde’ is at Theater Wit, 1229 W. Belmont Ave., Chicago, now through Oct. 15, 2017. For tickets and other information visit Theater Wit.